Gosh Da Reel dropped his debut album 'Scars, Wounds And Mercy' on his 26th birthday, 26 December 2018. The album features production from notable producers like DJ Pain 1 and Rayobeats. It also features artists notable artists like Priscilla Bailey, Tosin Oyelakin, Fega Michaels and many more. The album is available on all digital platforms worldwide. Read More Gosh Da Reel dropped his debut album 'Scars, Wounds And Mercy' on his 26th birthday, 26 December 2018. The album features production from notable producers like DJ Pain 1 and Rayobeats. It also features artists notable artists like Priscilla Bailey, Tosin Oyelakin, Fega Michaels and many more. The album is available on all digital platforms worldwide. 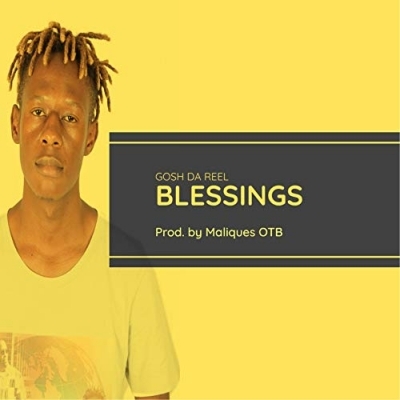 Gosh Da Reel is an award winning gospel rapper from Chiredzi, Zimbabwe. He won the BIWST #1 song of 2017 award in the UK. He was nominated Best New Artist at the 2014 Masvingo Music Awards in Zimbabwe. His single "Number"featuring Andrea De Beatboxer from South Africa is the first and only song by an African artist to top the Official European Independent Music Chart (broadcasting weekly on over 800 radio stations in Europe, USA and Canada) for three consecutive weeks. He is also the first artist to top the Be Inspired With Shoggy Tosh Top 10 (broadcasting on Salt FM UK, Liveway Radio Nigeria and Heartsong Live Scotland) for six weeks with his song "I Never Knew" featuring South African singer Lerato Happiness. He was also featured on a track called "Over There" by American singer Mike P Fitzpatrick which reached #9 on the Global Gospel/Inspirational Airplay Chart and #11 on the Euro Indie Music Chart. He was nominated in the same category with Lecrae and Fred Hammond for Best ! International Artist of the Year at the 2018 GXMMA UK Awards. He dropped his debut album "Scars, Wounds And Mercy" on December 26, 2018 which is also his 26th birthday.